It is probably everyone’s favourite dinosaur and certainly the largest meat eater to have lived, but it is surprising that despite there being enough fossil specimens to be found in the USA to uncover an almost complete dino every year, there is only been one Tyrannosaurus Rex footprint discovered. The tyrannosaur lived in North America during the Cretaceous period which spanned between 145 million years ago to 63 million years ago. The end of the period was marked by the mass extinction event that wiped out the dinosaurs forever. Although other dinosaurs were taller than Tyrannosaurus Rex, in the words of Professor Phil Manning of Manchester University, it was a ‘heavy-weight’ dinosaur, and although other carnivores such as Spinosaurus from the Jurassic period, were taller, none were as ‘hefty’. The most complete example of a Tyrannosaur was uncovered in South Dakota and named Sue after the palaeontologist who found it, Sue Hendrickson, and was so valuable she was subject to a court wrangle over ownership between several individuals and institutions. Eventually the court decided she belonged to the owner of the land she was found on, Maurice Williams, and was sold at auction for $7.6 million. Several more were uncovered including Stan, of which there is a replica in the Manchester Museum. This one is interesting in that in its skull is a hole that is the same shape as a Tyrannosaur tooth strongly suggesting they fought among themselves quite violently, possibly over food, maybe over mates. Sue, the most complete fossil skeleton of a Tyrannosaurus Rex specimen ever found. It was Professor Phil Manning who discovered the first known Tyrannosaur footprint in the Hell Creek formation in Montana. He’d seen it on the last day of an expedition in 2006 but did not have the time to investigate further, so he returned the following year and began to search for it all over again. 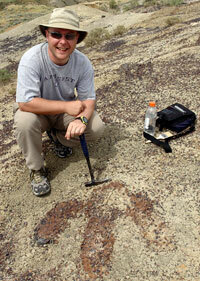 Professor Phil Manning poses next to the first Tyrannosaurus Rex track found in Hell Creek. It is rather unremarkable to look at and unless you knew what you were looking at you wouldn’t notice it. Rather thinner than one would expect a foot to be, the toes only just joined to the main foot and it is raised in profile rather than indented. And it is much darker than the rock around it. It measures around 29 inches long and similarly wide and was formed when a T-Rex walked in the clay of a flood plain, compressing it enough that it became tougher than the rock surrounding it and so it survived, just, when the rock around it eroded. As well as the footprint itself being the right size and shape for a T-Rex, the other compelling evidence that this is genuinely from a T-Rex is that it was discovered right where it is known T-Rex died, and therefore lived. One that was claimed to have been found in Mexico was disputed and dismissed as there was no sign anywhere near it that T-Rex was ever there. Now one has been found, others will come to light but considering the timescale it is astounding that even one survives.